Despite of snow, cool temperatures and “Nemos” (seriously, who names natural phenomena in US?) fashion week in NYC is still going on. “Snowstorms are so in right now, oh my god they’re so chic. They’re hot.New Yorkis kind of copyingPariscouture week. They kind of set the trend and now we’re trying to have our own snowstorm to upstage them” Harry and Peter Brant makes fun about Nemo to fashionista.com. There’s nothing to stop fashionistas from satisfying their fashion lust. Real fashion lovers even have enough courage to come to shows with bare legs. Well, that is a real commitment to fashion! 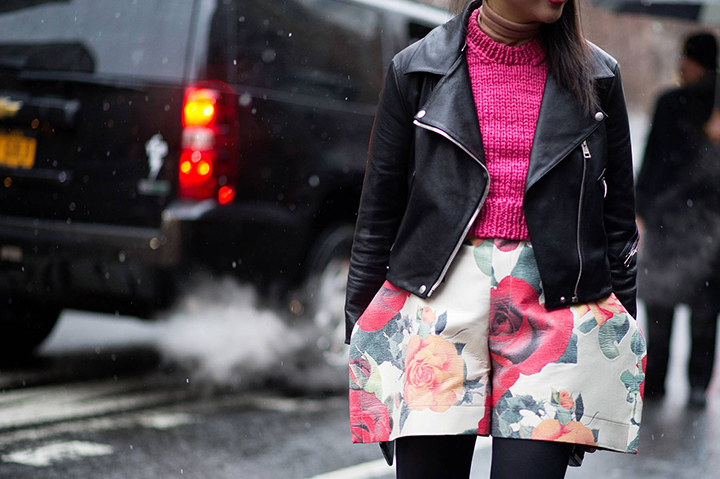 For this Monday we picked some pink lovers from street style blogs straight from NYFW. Pink looks so bright and cute in white background, doesn’t it?